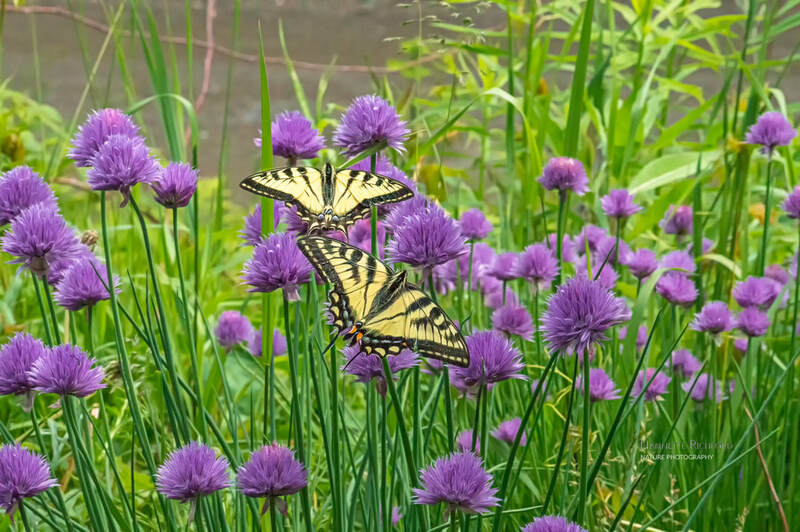 Chives are one of my favorite perennial herbs, not because they lend a delicate oniony flavor to recipes - although I love that too - but because they evoke memories of days gone by. These hardy herbs emerge in early spring in thick clumps of grass-like foliage and soon dazzle the eye with pompom blooms of lavender. They also attract a variety of butterflies. Once established, chives thrive in the same location for years and require little care. Soil: Plant chives in organic rich well-drained soil with a pH between 6.0 and 7.0. Add a two- to three-inch layer of compost of well-rotted manure to the soil and work it into the top six inches before planting chives. Organic matter provides slow-release nutrients, improves aeration and promotes good drainage. Lighting: Chives prefer full day sun, but will tolerate partial shade. For best results plant chives in a location that receives at least 6 to 8 hours of direct sunlight a day. Keep in mind that direct sunlight does not need to be consecutive. A few hours of direct sunlight in the morning, noontime shade and a few hours of direct light in the afternoon works well, too. Watering: Chives prefer moist soil, but will tolerate some drought. Water your chives once a week, saturating the soil to the root level - especially during hot dry periods. Fertilizer: Typically chives get the nutrients they need for healthy growth from organic matter in the soil. If growth appears stunted - or foliage yellows - apply a light application of 5-10-10 fertilizer in early spring when new growth appears. Follow with water-soluble fertilizer mixed to one half strength every four to six weeks during the growing season. Harvesting: Chives can be harvested at any time by clipping sections of the foliage. I typically prefer to remove the entire "leaf" and snip it into usable sections, but snipping the top from several stems works well, too. Maintenance: Cut chives back to the ground level once the flowers fade. This sends out a new flush of growth that often blooms again within a few weeks. Propagation: Chives are typically propagated by lifting and dividing the entire clump in early spring every three to five years. Replant in similar soil and light for best results. If you prefer to start new chive plants from seed, skip cutting the plants back and allow the flower heads to "go to seed." Each head contains hundreds of round black seeds ready for planting. Scatter the seeds over the desired area to start new chive plants. Add chives to your perennial bed for early spring color and interesting foliage that lasts all year.